Congratulations MAC Student Amy Helms! 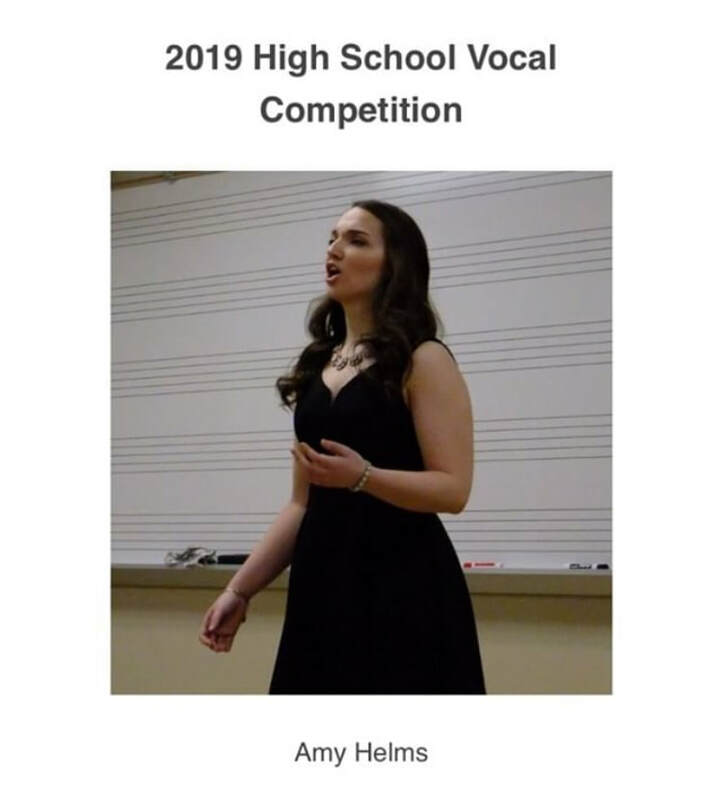 Amy Helms, student of Karl Resnik, recently placed first in the Opera Guild of Dayton's High School Vocal Competition! Congratulations to her, and all of the other MAC students who participated! Congratulations MAC Overture Finalists and Winners!!! Congratulations to Amy Helms and Sarah Koopman on becoming 2019 Overture Awards Finalists in the Vocal Music category, and to Jonah Sorscher for taking first place in the Musical Theatre category!!! Amy and Sarah will be awarded $1000 worth of scholarship from the Overture Awards, and Jonah will receive $4000 in scholarship! Pictured above are Jonah Sorscher and his vocal instructor, Kathy Cammett, after Jonah received the Musical Theatre categoy grand prize in the 2019 Overture Awards Competition. Congratulations MAC Schmidt Competition Finalists and Winners!!! Congratulations to MAC students Sam Owens and Amy Helms in their success at the Schmidt Vocal Competition at Miami University last Saturday, November 17, 2018. Sam Owens was a top five finalist and Amy Helms won first place. Congratulations to both of you!! 2018 - MAC Student, Abby Cates, advanced to the second round of The Voice! Congratulations!!! Check out more of Abby's work on her twitter, Instagram, and Facebook pages. 2018 - Abby Cates, The Voice audition. Congratulate Kalie Kaimann on her role in the upcoming show "Divine Will" that will air on TBN this month! Everyone should download her song on iTunes: "Holy Holy Holy" You can just search her name on iTunes and the whole show album will come up. Download her song and the others... the more downloads the more the networks will pay attention! Also Like "Divine Will TV" on Facebook! We are all very proud of Kalie! who just signed a contract for his first Broadway show "Book of Mormon" in NYC. MAC Student DOUG HANSFORD appeared in Menotti’s “Amahl and the Night Visitors” presented bythe CCO and Madcap Puppets. Here's what the Cincinnati Enquirer had to say about young Mr. Hansford's performance: "Doug Hansford, 12, a sixth-grader at Cincinnati Hills Christian Academy, was terrific as the fresh-faced boy who plays his shepherd’s pipe, greets the Kings with wide-eyed amazement and vehemently defends his mother when she is accused of stealing. Hansford sang sweetly in solos and duets, danced when he tossed away his crutch, and beamed an irresistible smile all evening."